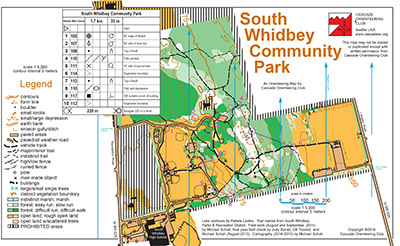 South Whidbey Community Park is a nice mix of open fields and a light but flexible trail network on a 1:5000 scale map. It is nicely self-contained, and when Cascade Orienteering Club has newcomer training on Whidbey Island, it happens here. Navigationally, it consists of three zones. First, an open area of baseball diamonds, a central building called “The Crow’s Nest”, and a substantial playground with gazebo. This area usually does not, but my, include Whidbey Island High School directly to the south. Surrounding this on at least two sides is an area of trails and vegetation with significant variety and some features in the lighter area, including knolls and some terrain changes. There is no specific perimeter trail. On the far east side of the map is another open, mowed space, accessible only by two woods trails. 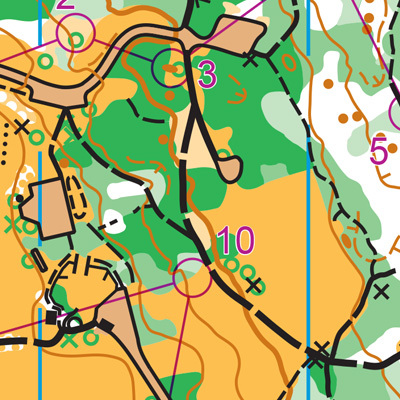 While this portion of the map is largely flat and mowed, there are some variations in contour and vegetation in one part that make this zone an interesting addition.